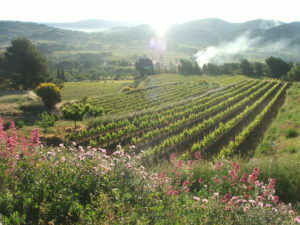 Domaine Vigneret produces mainly AOP Bandol wines on 16 ha but also AOP Côtes de Provence wines on 4.5 ha. The majority of the vineyard is located on the slopes of the Cadière d’Azur from a very long blue clay quarry, exploited at the time by the ancestors of Olivier Pascal for the manufacture of tiles. The vineyard, which benefits from a sunshine of 3000 hours per year, is broken down by the sea breezes of the valley of Saint-Côme which refresh and dry up the foliage during the nights. The Bandolais vineyard is particularly spoiled by nature. Located at the foot of the hills of Sainte Baume and Mont Caume, on the edge of the village of Bandol, Le Beausset, Le Castellet, La Cadière d’Azur, St Cyr sur Mer, Saint Anne d’Evenos, Sanary and Ollioules protected against violent winds coming from the north, it is entirely turned towards our great blue forming the most beautiful of the natural viticoles amphitheatres tempered by an omnipresent sun. Like the Mistral, he watches over the vines to restore order in the rows after each rain. So inevitably, in our region we have been making wine since the dawn of time. Not so foolish these Romans !!! They already appreciated the nectar of the so-called “Tauroentum”. With hard work in this so warm and arid terroir it is important not to forget the major ingredient: “our friend the Mourvèdre”, of Spanish origin, this black variety, difficult, complicated and capricious found its Place in our beautiful marine hanse of TERROIR DE BANDOL. 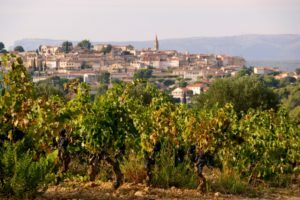 Since a few years the notoriety, the communication and a certain fashion on the rosé wines of Provence are such, that a majority of the consumers have forgotten or do not know that the soil of Bandol made its reputation on the quality of its red wines Thanks to its Mourvèdre variety. Powerful wines with aromas of ripe red fruits, truffles and undergrowth. A dark and sustained dress, a powerful, wild nose with notes of licorice and spices. A generous and ample mouth. 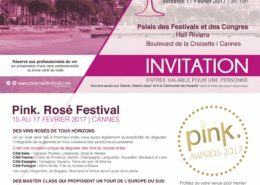 The rosés of Bandol are very complex wines, of a beautiful length and amplitude on the palate with subtle notes of citrus and peaches, hence their reputation as roses gastronomy even very pleasant after 2 or 3 years. 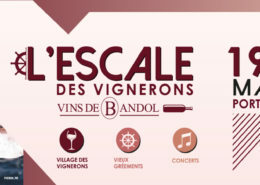 The whites of Bandol are produced more confined since they represent 10% of the total production. Mediterranean whites, round and fat at the same time, ending on perennial note and fresh. Their major flavors are often sweet pineapple, litchi and small white flowers (hawthorn, acacia).